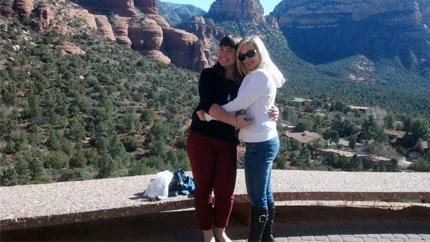 Claire (right) and FLEX student Anna pose in front of the Sedona Red Rock Mountains. Photo courtesy of Claire Mattern. Claire’s first exchange student was Tijana, an A-SMYLE student from Serbia. Mattern said overcoming prejudices that foreigners have about Americans and vice versa is her favorite part of hosting exchange students. She has been surprised to learn what people from other countries think about America and Americans, and works to help her students leave with an informed opinion on the United States. Mattern’s two sons have grown up with exchange students in the house – her youngest son was two-years-old when their first student came and he is now 11. She believes their lives have been enriched by this constant global exposure. She keeps in touch with all of the students she has hosted, and loves seeing and hearing about the impact she has had on their lives. She remembers a trip she took with Tijana down the California coast, when the family saw a whale in the Pacific Ocean. Tijana began to cry, explaining that she never dreamt that she would see something like that in her life.